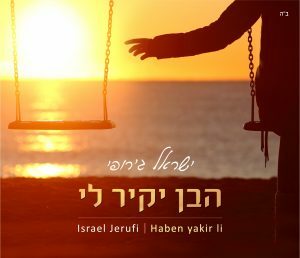 Now Yisrael presents his first single dedicated to Hadari’s memory. Even in the most difficult of times, Hadari took great pleasure and exceptional joy in Jewish and Chassidic music. The tune itself, written by Reb Shalom Charitonov, masterfully combines pain and longing with a spark of joy and hope, and is often sung by Chabad chassidim during the prayers of Rosh Hashana and Yom Kippur. Yisrael chose this extraordinary and wonderful nigun, which has never been arranged and presented publicly, because it evokes and expresses, both in its’ tune and words, his personal experience in these last years, and especially these last months. Towards the end of the song, marked by Yisrael’s grace and Chassidic depth of feeling, and arranged by the great Yaakov Asaraf, is a short excerpt from the Lubavithcer Rebbe’s ‘blessing of the children’ to the students of the Tomchei Temimim yeshivas that came to be with the Rebbe during the high holidays. The Rebbe, who himself never had children, saw the yeshiva students as his children. The ‘blessing of the children’ is traditionally given by a father to his children on erev Yom Kippur. Moments before the beginning of the awesome holiday prayers, thousands of yeshiva students would gather together, their hearts skipping a beat, to receive the Rebbe’s special, powerful and moving blessing.